Drunk driving accidents are not really accidents at all. When people drive drunk, they have made a decision to put themselves and others at risk for injury or death. 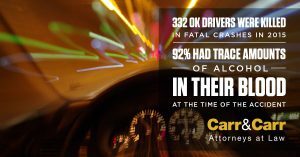 The Oklahoma personal injury lawyers at Carr & Carr Attorneys at Law provide aggressive representation for victims of crashes that involve drunk driving. If you were hurt or a loved one was killed in a collision caused by an intoxicated driver, call us at 888-241-3130 or contact us online to learn how we can help. Initial consultations are free, and our attorneys work on a contingent-fee basis, which means we don’t get paid unless we recover compensation on your behalf. Although alcohol-related crashes have declined in recent years, drunk driving remains a deadly problem in Oklahoma and across the nation. 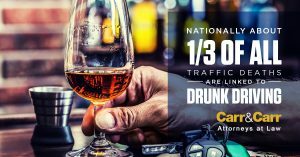 In fact, according to data from the Centers for Disease Control and Prevention (CDC) Oklahoma has a higher rate of fatal drunk driving crashes than the national average. From 2003-2012, 2,205 people were killed in drunk driving crashes in Oklahoma. Of the 332 Oklahoma drivers killed in fatal crashes in 2015, 92 percent had at least trace amounts of alcohol in their blood and about 25 percent had a blood-alcohol content (BAC) over the legal limit of 0.08 percent. Nationally, about one-third of all traffic deaths are believed to be linked to drunk driving. Drunk driving collisions often result in severe injuries or death to innocent people. If you were hurt in a drunk driving crash, you may be facing extensive medical costs, time away from work, and the need for long-term treatment. If a loved one was killed in a crash caused by an intoxicated driver, surviving family members may be able to seek compensation through a wrongful death lawsuit. Drunk or drugged driving also carries criminal implications. For example, consequences for driving under the influence (DUI) range from misdemeanor to felony charges to negligent homicide if someone is killed. The criminal court system punishes drunk drivers who cause accidents, but it doesn’t compensate the victim of a drunk driver. Victims and families who’ve suffered a drunk driving tragedy have the right to hold that drunk driver accountable for the injuries, death, or property damage they cause. Insurance companies work hard to limit what they pay to accident victims, and their primary settlement offers are often insufficient for victims’ needs. Furthermore, they may pressure victims to accept an unfair settlement with the promise of fast payment. Our lawyers understand the extensive medical expenses and other costs associated with traffic accidents, and we also know the tactics insurance providers use. If you’re a drunk driving accident victim, it’s advisable to talk with an experienced personal injury attorney before accepting a settlement. Carr & Carr Attorneys at Law has been helping injury victims since 1973, and we are dedicated to recovering the financial security injured people need to move forward with their lives. If you or a loved one was hurt in a drunk driving crash, please call us today at 888-241-3130 or contact us online for your free, no-obligation consultation. We are proud to represent clients throughout Oklahoma and northwest Arkansas via offices in Tulsa, Oklahoma City and Springdale.